Did you know that baby teeth are actually very important for your child’s development? 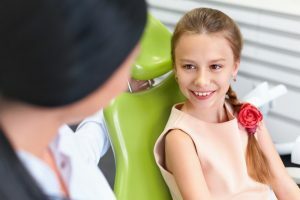 Until the adolescent years, they will not only help your youngster bite and chew (i.e., get proper nutrition) and speak correctly but also help guide the permanent teeth underneath them into proper position. In fact, one of the most important functions of baby teeth is to hold space for the adult teeth that will eventually push them out and thereby, end up in the proper position. At least that’s how it’s supposed to work; sometimes, however, injury or disease can cause a baby tooth to be lost prematurely. When that happens, the permanent teeth that are coming in on either side can actually drift into the space that was reserved for another tooth. This can cause teeth to erupt out of position or to be blocked entirely, and it may result in crowded or crooked teeth, ultimately causing bite problems. Fortunately, if your child loses a tooth prematurely, there’s a dental appliance your orthodontist will use to hold the space open for the permanent tooth that is meant to fill it. The device is called a “space maintainer” or a “space maintenance appliance.” Made of metal and/or plastic, space maintainers can be fixed (cemented) or removable, but either way their purpose is the same: to help your child develop the best bite possible and hopefully avoid the need for braces later on. Space maintainers are also useful when one or more permanent teeth are congenitally missing — in other words, they have never existed at all. In cases like this, which are not uncommon, permanent dental implant teeth are often recommended for adolescents or adults to replace a tooth they weren’t born with. But timing is very important with dental implants — they can’t be placed in a growing child. Therefore, we may use a space maintainer with a false tooth on it until jaw growth is complete and an implant can be appropriately placed. It’s a simple, non-invasive way we can avoid a malocclusion (bad bite) with some timely intervention. Fixed Appliances: are cemented onto adjacent teeth. They are made in many different designs: One consists of a band that goes around a tooth and then a wire loop that extends out from the band to hold the space; another features a loop attached to a stainless steel crown, which goes over a nearby tooth. In either case, the loop extends just to the point where it touches the next tooth. Fixed space maintainers are often preferred with younger children, because they are less easy to fidget with, break, or misplace than appliances that can be removed. Removable Appliances: Removable appliances look like the type of retainer that is worn at the end of orthodontic treatment. It can have a false tooth on it, which is particularly useful when the lost tooth was visible in the mouth. Older children can usually handle the responsibility of wearing this appliance and caring for it properly. When the best choice of appliance is made for your child, we will take impressions of his or her mouth and make a custom-made appliance to fit their unique mouth. The appliance will be worn until x-rays reveal that the permanent tooth underneath is ready to erupt naturally. While your child wears the space maintainer we’ll be recommending they keep up good oral hygiene at home as well as come in for professional dental cleanings.